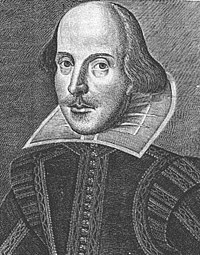 Unsurprisingly, given his stature as one of the greatest writers in the English language, William Shakespeare (1564-1616) has directly or indirectly inspired a huge number of British films - and an equally wide range of interpretations. The first Shakespeare film in any country was made in 1899, a simple photographic record of a small part of Sir Herbert Beerbohm Tree 's stage production of King John . The next three decades would see varied approaches to the challenge of filming Shakespeare in a medium denied the spoken word, from the imaginative tableaux-style mime of Percy Stow 's The Tempest (1908) to truncated productions of the major tragedies ( Richard III , 1911; Hamlet , 1913). Animator Anson Dyer also made a number of Shakespeare burlesques, most of which have sadly been lost. When sound was introduced, British cinema was slow to tackle Shakespeare - the first straight adaptation, As You Like It , didn't appear until 1937, and the next one after that was released in 1944, though Laurence Olivier 's unashamedly patriotic Henry V also turned out to be the first unchallenged British Shakespearean masterpiece. The next decade would see Olivier dominating British Shakespeare film with similarly memorable adaptations of Hamlet (1948) and Richard III (1955). From the 1960s, other major directors attempted filmed Shakespeare, with variable results - Tony Richardson 's Hamlet (1969) essentially aimed a camera at his Roundhouse stage production, Peter Brook 's King Lear (1970) transplanted the play to wintry Denmark and Roman Polanski 's violent, blood-spattered Macbeth (1971) matched the pessimism of its era. By contrast, Franco Zeffirelli 's Romeo and Juliet (1968) was a lavish and opulent costume drama, achieving a perfect balance between fidelity to the play and attractiveness to younger audiences. Shakespeare films became notably more experimental in the 1970s, with Celestino Coronado 's avant-garde Hamlet (1976) and Derek Jarman 's radical reworking of The Tempest (1979) paving the way for Peter Greenaway 's Prospero's Books (1991) and Tom Stoppard 's Rosencrantz and Guildenstern are Dead (1990), inspired by The Tempest and Hamlet respectively. More recently, Kenneth Branagh has donned Olivier 's mantle on both sides of the camera and has made a number of acclaimed Shakespeare films, from his directorial debut with a rather darker vision of Henry V (1989) to the 1930s musical version of Love's Labours Lost (1999) via the first film version of the uncut Hamlet (1996). There have also been a number of modern updates or contemporary stories clearly inspired by Shakespearean themes. Othello was particularly fruitful in this respect, inspiring Venetian melodrama Carnival (1921, remade 1931), romantic comedy Men Are Not Gods (1936) and All Night Long (1961), set amongst the London jazz scene. Gangsters feature in Joe Macbeth (1955) and My Kingdom (2002, based on King Lear), while the second big-screen As You Like It (1992) transplanted the play to a run-down London housing estate, with mixed results. But Richard Loncraine and Ian McKellen 's daring update of Richard III (1995) to an imaginary Fascist Britain was a triumph, showing just how richly imaginative British Shakespeare films can be when they have the courage of their convictions.